At River Lake Clinic we love helping you select your new eyeglasses. We work with you to make a selection that best fits your lifestyle. We help our patients to understand that both eyeglasses and contact lenses require careful handling and cleaning. Both can be excellent methods of vision correction. Eyeglasses and contact lenses can correct all refractive errors, including: astigmatism, myopia, hyperopia and presbyopia. We only work with the top eyeglasses designers and distributors to bring you the best quality eyeglasses that are both durable and stylish. We provide convenience and complete maintenance and adjustments for your eyeglasses. In addition, we often provide a one or two-year warranty on frames, lenses and lens treatments. 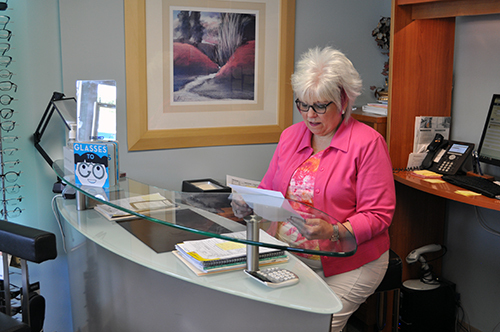 Contact our clinic today or stop in and browse our large selection of high-quality frames. Receive expert advice and proper measurements for your eyeglasses from our staff. At River Lake Clinic in Minneapolis, Minnesota, we love helping you select your perfect means vision correction. For 40 years, we have worked with patients to prescribe the best lenses and select the perfect frames to fit your lifestyle. Eyeglasses and contact lenses can correct all refractive errors including astigmatism, myopia, hyperopia, and presbyopia. When you need vision correct, River Lake Clinic doctors will provide you with exceptional eye care services, including preventative eye exams, medical eye exams, eyeglasses prescriptions, and contact lens fittings and evaluations. River Lake Clinic’s Opticians are paraoptometric-certified by the American Optometric Association. You are in good hands with our opticians who know the art and science behind your vision correction. They can assist you with frame selection, lens selection, eyewear fitting and adjustments, and contact lens training of insertion and removal.